If your thinking of going to Italy and robbing a bank or committing some kind of (getaway necessary) crime, Think again! 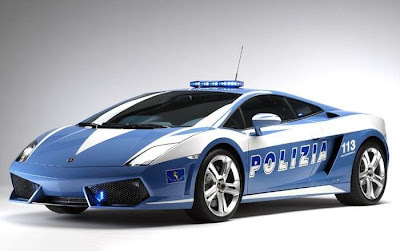 The Italian Polizia have recently unveiled their new high performance Lamborghini Gallardo police car. The Lamborghini Gallardo is an all wheel drive vehicle. It has a 5.2 Liter V10 engine with 560 horsepower. It's Capable of going from 0 to 60 in 3.5 seconds. They couldn't afford a good driver.